Increasing our state investments in the crucial ages from birth to age five supports improved educational outcomes throughout a child’s life. 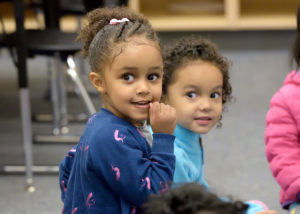 High-quality early childhood education has positive impacts on kindergarten readiness (1), third grade reading levels (2), performance on tests throughout elementary school and to the end of high school (3), high school graduation (4), and enrollment and persistence in postsecondary education (5). The benefits also encompass a wide array of positive societal outcomes, including less engagement with the criminal justice system, and increased earnings and family stability as an adult (6). Home visiting – an early childhood education strategy in which a nurse or other professional coordinates services to families in their home – decreases the likelihood of abuse or neglect (7) while improving family economic self-sufficiency (8). Every dollar Washington invests – and has invested in the past – returns significant value to our state. Early childhood education programs in Washington state – like the Early Childhood Education and Assistance Program (ECEAP) – have a $4.75 return on investment for every $1 spent (9). Evidence-based home visiting can return benefits from $1.80 to $5.70 per dollar spent. Our previous state-level spending has ensured that we have two key infrastructure components already in place – a quality rating and coaching structure to ensure kids are in high-quality early care, and a research-proven, state-funded program for the highest need kids to get the supports they need to start school fully kindergarten ready. Now is the time to see these previous investments through to their full potential, and to do the work to ensure we maximize our K-12 investments. Increasing our reimbursement rate for Working Connections Child Care and ECEAP to the federally required level in each region. Investing more money in home visiting as the foundation of our 0-3 educational investment strategy – to help families when kids have the greatest amount of brain plasticity and growth. Meeting our current ECEAP entitlement goal to make sure that the kids who need the most intervention are able to access our research-proven programming. 2. Karoly, Kilburn & Cannon (2005). Broberg, Wessels, Lamb, & Hwang, “Effects of daycare on the development of cognitive abilities in 8-year olds: A longitudinal study,” Developmental Psychology, 33(1): 62-9. 3. Gilliam & Zigler, “A critical meta-analysis of all evaluations of state-funded preschool from 1977 to 1998: Implications for policy, service delivery and program evaluation,” Early Childhood Research Quarterly, 15(4): 441-73. 4. Barnett, “Long-term effects of early childhood programs on cognitive and school outcomes,” The Future of Children 5(3): 25-50. 5. Karoly, Kilburn, & Cannon, “Early childhood interventions: proven results, future promises,” RAND Corporation (2005). Marcon, “Moving up the grades: Relationship between preschool model and later school success,” Early Childhood Research and Practice, 4 (1): 1-24. 6. Masse & Barnett, “A benefit-cost analysis of the Abecedarian Program,” National Institute for Early Education Research (2003). McKey et al, “The Impact of Head Start on children, families, and communities: Final report of the Head Start evaluation, synthesis and utilization project,” 1985. 7. DuMont, Kirkland, Mitchell-Herzfeld, et al, “A Randomized Trial of Healthy Families New York (HFNY): Does Home Visiting Prevent Child Maltreatment?”; Olds, Kitzman, Hanks, et al., “Effects of Nurse-Home Visiting on Maternal and Child Functioning: Age Nin Follow-Up of a Randomized Trial” Pediatrics 114, 6 (2004): 1560-8. 8. Olds, Henderson, Tatelbaum, et al., “Improving the Life-Course Development of Socially Disadvantaged Mothers: A Randomized Trial of Nurse Home Visitation,” American Journal of Public Health, 78, 11 (1988) 1436-45. LeCroy and Krysik, “Randomized Trial of the Healthy Families Arizona Home Visiting Program,” Children and Youth Services Review, 33, 10 (2011): 1761-6. 9. Kay & Pennucci, “Outcome Evaluation of Washington State’s Early Childhood Education and Assistance Program. (Doc. No. 14-12-2201). Olympia: Washington State Institute for Public Policy, 2017.